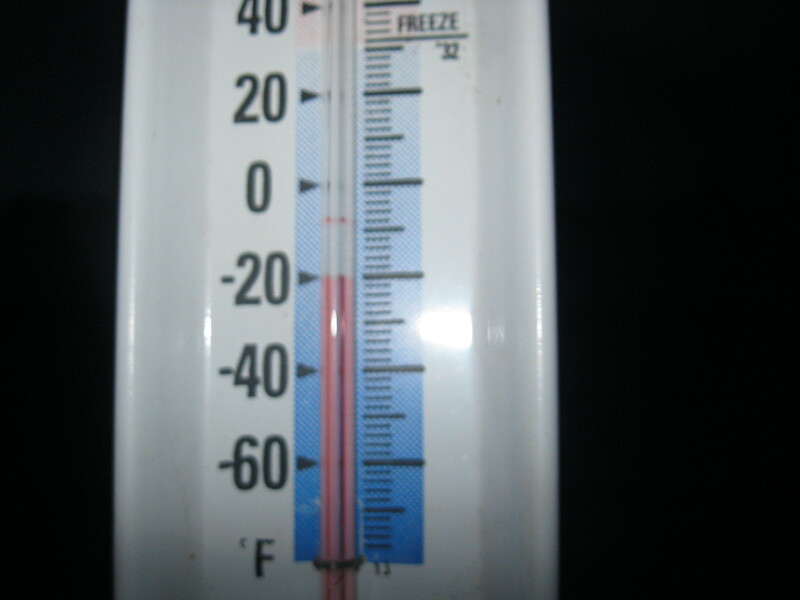 Yet another thermometer pic! But it’s 20 below!!! This week was SO cold! I’m pretty sure it never got above freezing. Most of the mornings were around -20 degrees! Everyone here in town has been saying how it is rare for extreme cold like this to last more than a day. I have definitely never been in weather like this before! I always wear long sleeves, a fuzzy jacket, my heavy jacket, two-three pairs of leggings, a hat, an ear band, and my heavy boots! With all that, I’m actually doing pretty well despite the cold. The important thing is to NEVER take off your gloves! I stupidly learned that the hard way this week. I took them off for maybe five minutes tops to take a picture, and when we got inside they hurt so bad! I only needed to learn that lesson once! On Monday, Sister Bateman and I got pedicures, and they were glorious! Its little things like that that help us still feel like girls, and not just robot-missionaries. I got a little candy-cane design on my big toes- so cute! Monday night we brought back one of our Sister-Training-Leaders, with us for an exchange. It was a super short exchange (only Monday night! ), but it was definitely helpful. Monday night it snowed another 4 inches, but this time the wind was blowing really bad so it seemed worse. My hair was totally dry when we went out! 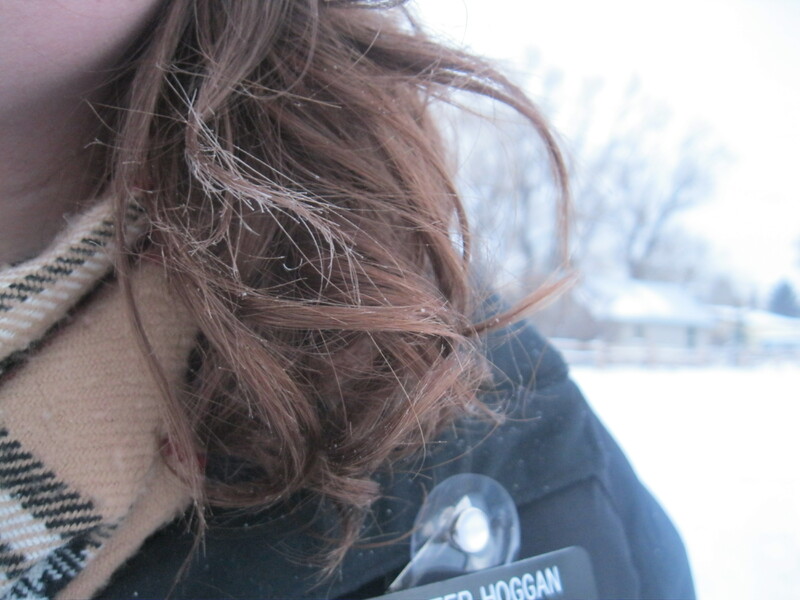 The blowing snow makes my scarf and hair wet so it froze. My companion went out with wet hair one day, and her hair was even more frozen than mine! It was hilarious. Tuesday morning we had to make the decision if we were going to try to drive to Cody for District meeting. We called our District Leader, prayed about it, and decided to go ahead and go! The road to Cody it turns out was really bad… I was praying the whole time I was driving! About halfway there, the visibility got so bad that we slowed down to about 10mph for a minute or so. But thankfully the Lord protected us and we arrived in Cody safely! Instead of it taking the normal 35 minutes to get there, it took us like 50 minutes. Better safe than sorry! We had a pretty cool miracle this week. While we were in Cody on Tuesday, one of our investigators called us. She said that she wanted to discontinue our meetings, so basically she dropped us. We were heartbroken of course, but we asked if we could still come by and at least visit with her. She agreed, so we went ahead and stopped by that evening. When we got there, we chatted for a while and she had such a change in her heart! By the end of our meeting, she asked us when we were going to give her the Book of Mormon that we promised her! The Lord really does send the Holy Ghost before us everywhere we go. It is not without divine assistance that we were able to have that meeting go so well. On Friday we were finally able to get our windshield replaced! The crack had stopped spreading, but it was making the inside of our car frost! Every time we drove we would have to scrape the outside, and then scrape the inside. So Friday we drove in to Cody early and dropped off our car at the replacement place. Then the Cody sisters picked us up, and we spent the day with them! We got to help out at the Cody food bank and check a ton of bread for mold. Our car didn’t get done till around 3, so we were pretty late about getting back to Meeteetse. I swear that some weeks we spend more time in Cody than in our area! The Bishop here asked us if we would teach seminary next semester! The current teacher is moving just after Christmas. 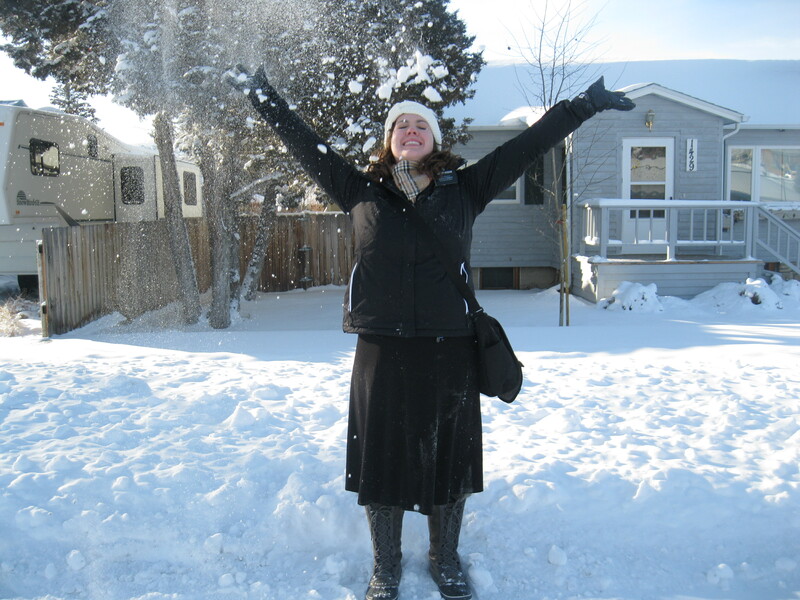 We were able to get it approved, so we’ll be teaching seminary! Last night we got to watch the Christmas devotional over at a member’s house. We had invited one of our investigators, but when we went to pick her up, she said that she was too tired to go. She sure missed out! 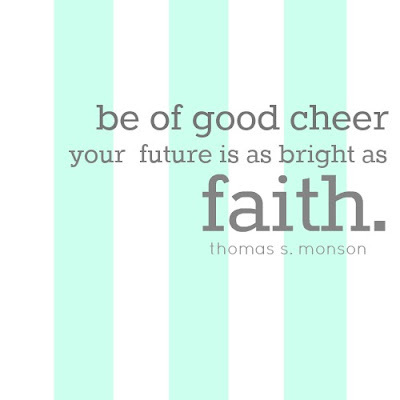 I love the Christmas devotional. I now really feel like the Christmas season has begun! On Sunday I sang in church! I sang Sally Deford’s arrangement of “I Heard the Bells on Christmas Day” (It’s so much better than the hymnbook one in my opinion). I felt like it went really well! Everyone in the ward was so sweet to me afterwards and thanked me for singing. I just love how music brings the Spirit so strongly. It can change my whole attitude about the day!